For those of you who follow me on Snap or my personal Instagram account, @graymalinpersonal, you already have seen sneak peeks into the project that was my KITCHEN REDESIGN. It warrants all CAPS because something that started out as a small project became a massive one! You know how that goes though, right? Once you get started, it becomes a domino effect, and then you simply must do it all! To start out this great BEFORE and AFTER redesign story, I thought I'd take you all way back to what the kitchen looked like before we moved in. These are the exact images that my husband and I saw prior to looking at the house that we eventually purchased and moved into almost three years ago. For us, the kitchen is an extremely important room; we love to cook and entertain so it was the first room we focused on making our own. 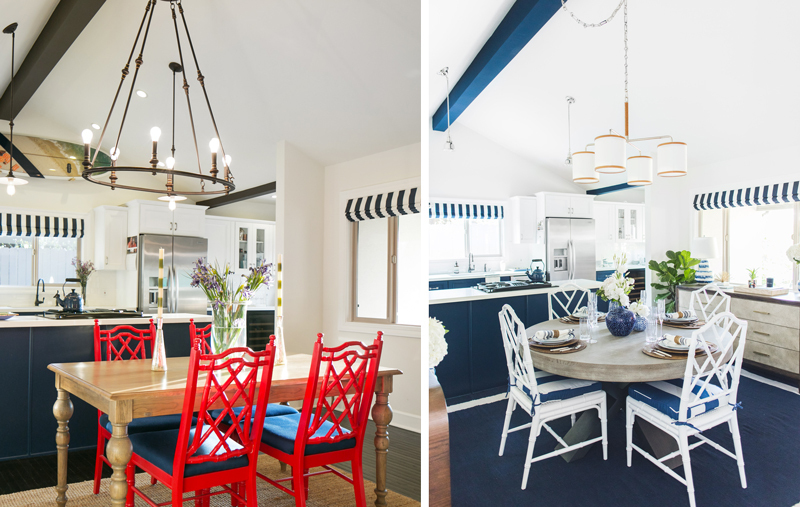 The weeks before we moved in, we completely redid the kitchen to be navy and white. We added a white subway tile backsplash, white cabinets above the counter, and navy cabinets below. We splurged on the custom roman navy and white shades and then simply ran out of funds for the dining area furniture. To make our kitchen functional, we found a price-friendly table online and the chairs on Craigslist to add a fun pop of color. With a few updates in place, we were happy but certainly not finished. As we all know, unless you're not hindered with a budget, you simply can't do it all at once. To me, a house is like a great cake — it takes many layers of time-intensive preparation to present a beautiful final result that feels warm, inviting, and most importantly a reflection of your personal style. With that in mind, after three years of prep, it was time to add that final layer. Plus, to add that extra icing on top, my family is coming for Thanksgiving this year and I really want to make it special for them! 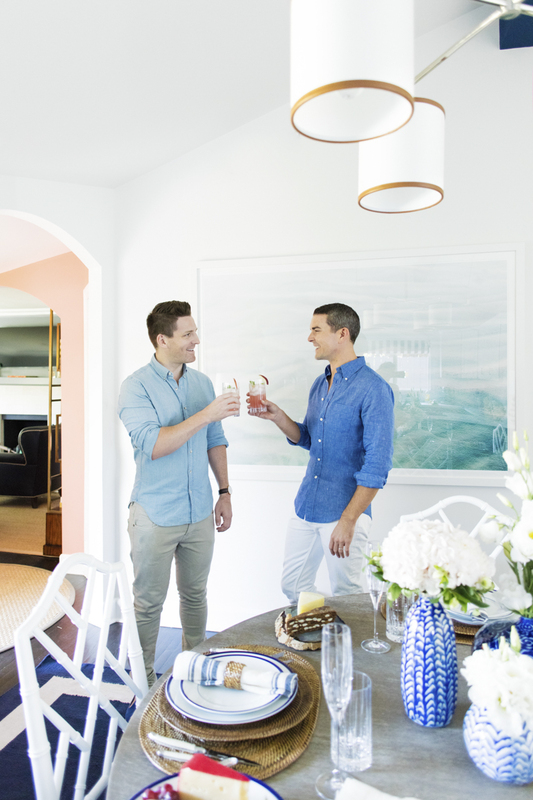 Teaming up (again) with designer Orlando Soria from Homepolish, a personalized and flexible by the hour interior design service with 500 designers country wide, we started with a meeting in the kitchen to talk through the end goal. 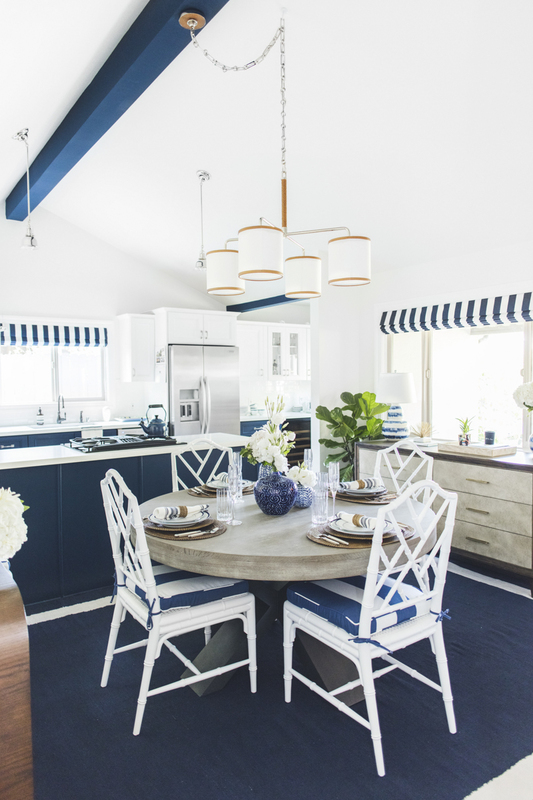 Knowing I wanted to keep within the nautical look that was already established but with elevated furniture and other decorative accents, I also reached out to Williams-Sonoma Home to see if they too would like to partner in this redesign. Much to my delight, they said yes (!! ), and the rest, as they say, is history. First and foremost, the inspiration for this redesign began with the desire for a round table. This has always been a favorite of mine, as it allows for everyone to feel connected during a dinner party. 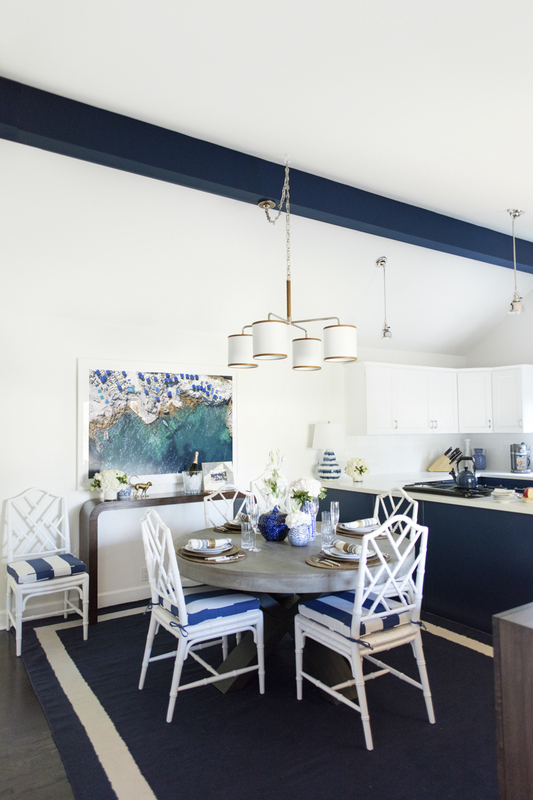 I also really wanted to paint the large beam on the ceiling navy blue to extend the feel of the kitchen space across into the dining area. The Navarro Round Dining Table wasn’t the first table I considered from William Sonoma, but something about it kept bringing me back for a second look. The texture of the wooden top is fantastic against the smooth white caesarstone counter, and I was really drawn to the strong bronze-finish of the X-shaped base. I also chose classic Chippendale chairs to go with the table for a nice burst of bright white in the middle of the room. 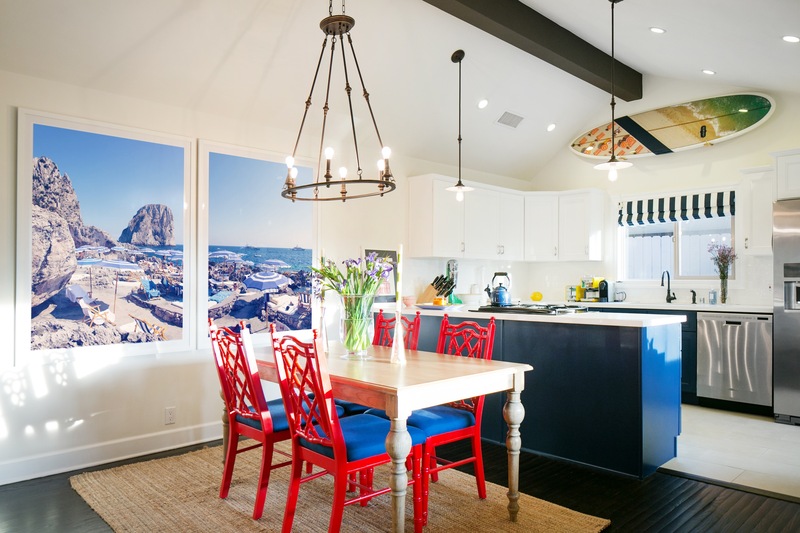 Having the dining table in place, I turned my attention immediately to the artwork before going any further — I knew that whatever art I selected would indicate the rest of the furniture, tableware, and decorative accessories around the dining table. Ocean Rain, which I shot in Nantucket this summer and was recently released for sale, was the first choice for the space. During my photo shoot it began raining and the rain drops created a beautiful texture atop the swirling greenish-blue sandy water. Therefore, to really make an impact, I had our largest-sized print framed with Framebridge in a bright white frame. Because the photograph was such a focal point, I began to look for furniture that paired beautifully with the color and texture: the Parchment Dresser became my first pick and it is the new home to my ever-growing tableware collection. Capri da Luigi is the other piece I chose to decorate with. It is quite literally one of my favorite beach clubs in the world — so why not have it in my favorite room to enjoy? Seeing the final redesign, I have to say that I really love the palette of grey, brown, and navy colors mixed with the two photographs on the wall. All of the furniture plays off one another; I am especially happy with the Umbria console, which is absolutely stunning in person. 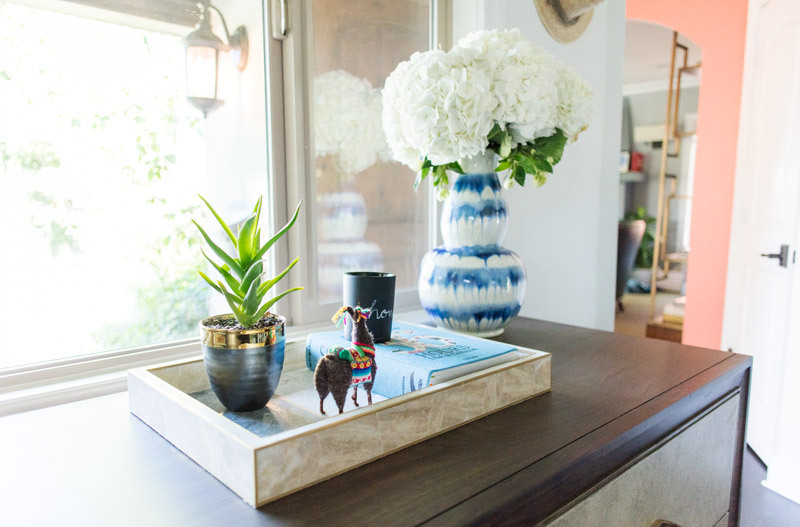 It is made of oak with an espresso-hued finish; and, although you can't see it up close, I'm obsessed with this brass monkey accessory that's hanging out next to the flowers. I have a feeling he's going to make appearances all over the house! To celebrate the completion of the redesign and a job well done, I invited Orlando over to officially cheers to the new and improved kitchen. He is such a joy to work with as he really pushes you to think more long term in the evolution of space and functionality. I give him full credit for the selection of the lighting fixtures, which turned out to be the most difficult piece of the redesign puzzle. The ceiling in our kitchen is not quite symmetrical, so naturally it caused a bit of a challenge. Luckily, Orlando's eye for proportion helped avoid a major disappointment, and the ones he suggested were the perfect choice for the space. The chandelier has a nice leather accent that adds to the texture of the room and the chinoiserie lamps and vases give some curve to the linear walls and large navy beam on the ceiling. Since the kitchen is always the place to be when people are over, I wanted to make sure it evoked a welcoming relaxed feel. I especially love the mixture of the ceiling lighting with the light from the side table lamps at night — it sets a nice mood and ambiance for a warm and fun dinner...which I'm happy to report has been tested a few times to much success! 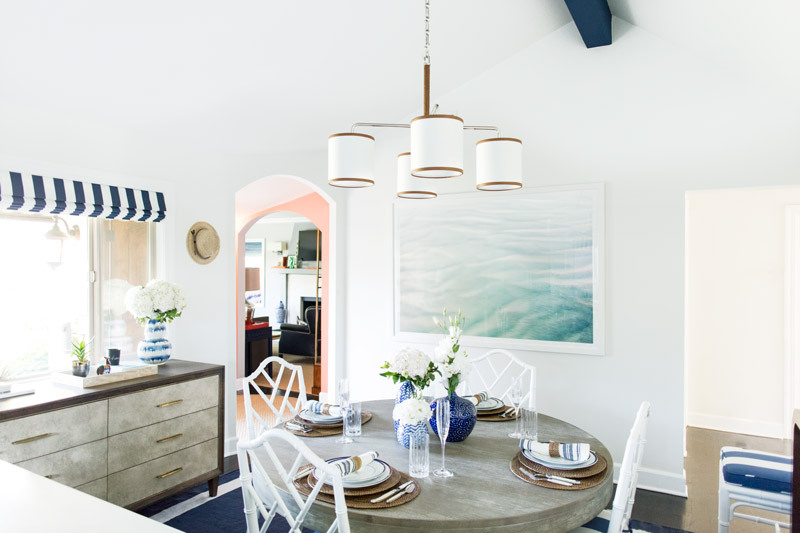 See more from the aerial beach collection as well as Homepolish's coverage on the redesign and shop the story from Williams-Sonoma Home, which I'll share shortly. 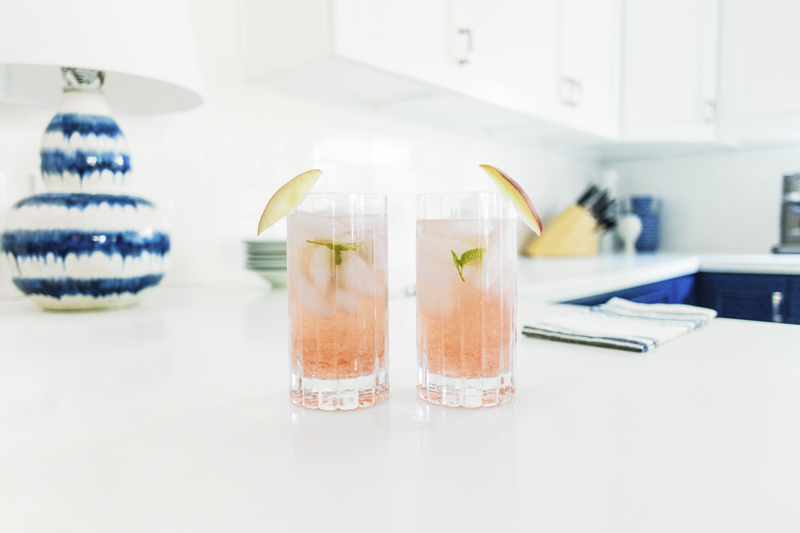 Oh and by the way, if you're looking for a tasty cocktail to kick off a gathering at your home, you should definitely try this delicious peach ginger vodka cocktail from my kitchen christening because it was a complete hit! 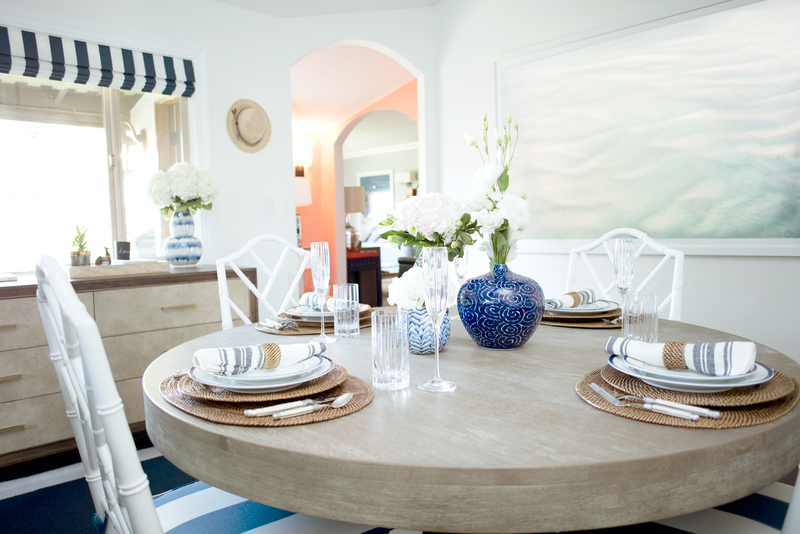 Shop the Post Gray Malin: Ocean Rain, Capri da Luigi Beach Club, Construction Paper I, and La Dolce Vita William Sonoma: Camilla Table Lamp, Ceramic Drip Vase, Porcelain Bud Vase, Geo Stone Tray and Dorset Glassware Collection Homepolish: Take the stress out of doing it yourself! Get in touch with Homepolish and link up with an interior decorator that will help you achieve what you have in mind and more!